Favoured to promotion gifts but need something to really 'inject' life into your business? Our Syringe Pen for Business Gift will have customers remember your company's brand name, and logo crest. 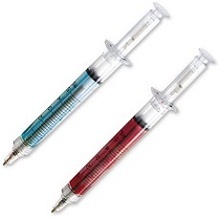 Filled with an insane blue or red liquid that almost imitates a real syringe, the Syringe Pen for Business Gift is fitted with high quality blue ink inserts for that long lasting and quality performance ink to ensure it gets to the top of all those other stationery items, branded or otherwise. Ideal for the medical and veterinary industry, you can personalised these syringe pens with a customised print of your brand name and logo. For a FREE QUOTE, please fill in the form regarding our Syringe Pen for Business Gift and we'll be able to help you.